An update on progress being made in Wales towards the achievement of the 7 well-being goals. This report provides an update on progress being made in Wales towards the achievement of the 7 well-being goals. It is a statutory report required under the Well-being of Future Generations (Wales) Act 2015. It is a report concerning the collective progress of Wales as a nation. It is not a report on the performance of an individual organisation. The first report was published in September 2017. The Well-being of Future Generations (Wales) Act is about improving the social, economic, environmental and cultural well-being of Wales. It is intended to make the public bodies listed in the Act think more about the long-term, work better with people and communities and each other, look to prevent problems and take a more joined-up approach. This in turn is intended to create a Wales that we all want to live in, now and in the future. 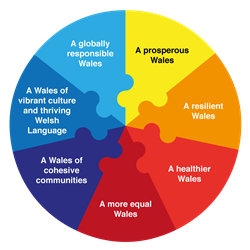 The Act also puts in place seven well-being goals for a prosperous, healthier, resilient, more equal and globally responsible Wales, with cohesive communities and a vibrant culture and thriving welsh language. For more background information on the Act please see the Essentials guide. What are the national indicators for Wales? The Act required Welsh Ministers to set national indicators to assess progress towards achieving the well-being goals. From September 2015 to January 2016 Welsh Government undertook a widespread public consultation to identify what small set of indicators should be developed to best measure progress against the well-being goals. These national indicators were published in March 2016 and laid before the National Assembly for Wales. The national indicators are designed to represent the outcomes for Wales, and its people that will help demonstrate progress towards the 7 well-being goals. They are not intended to be performance indicators for an individual organisation. Full description of the national indicators including their technical definition and information about their data sources and frequency can be found in the technical document. Many national indicators will help tell a story of progress in Wales against more than one of the Well-being Goals, or United Nations Sustainable Development Goals. We have produced an interactive application mapping indicators to those goals. How does this relate to the UN Sustainable Development Goals? The 2030 Agenda for Sustainable Development is a transformative plan of action based on 17 United Nations Sustainable Development Goals – to address urgent global challenges over the next 15 years. The United Nations’ 17 global goals mean that every country on the planet will have to take action to end poverty, promote prosperity and well-being for all, protect the environment, and address climate change. Those goals are meant to be far-reaching, people-centred, universal and transformative. UN member states have committed to working tirelessly towards their implementation by 2030, and Wales will play its part. Many national indicators will help tell a story of progress in Wales against more than one of the United Nations Sustainable Development Goals. We have mapped the indicators against the goals. Under the globally responsible chapter of the report we have more clearly brought out some of the indicators and contextual data that directly relate to the UN SDGs from the perspective of Wales’ global contribution. As well as setting National Indicators, the Act also requires Welsh Ministers to set National Milestones to assist in measuring whether progress is being made at a national level towards the achievement of the well-being goals. In July 2018 the Cabinet Secretary for Finance confirmed plans to consult later this year on the criteria for selecting milestones and on proposals for which Indicators might have related milestones. The report has been published in September to ensure it is as close as possible to the end of the preceding financial year, but after the publication of the National Survey for Wales which is the source for 14 of the national indicators. The data for the national indicators will be kept up to date as new datasets are published for those indicators. In September of each year we will publish an updated Well-being of Wales annual report containing updated narratives for each goal. The coverage of the report is Wales. For some indicators, reference is made to the position relative to the UK. The narrative against the goals and for each indicator is based on national progress against the goals, and it does not seek to provide a report on progress at different geographical levels. However data for many indicators are available on StatsWales, or on request, at lower levels of geographical detail. This report has been produced primarily as an interactive on-line report to maximise impact and efficiency using the Welsh Government open data services. The annual version of the report containing the seven progress reports against the goals has also been produced as a printable PDF document. The majority of the data underlying the report, including much more detailed breakdowns, are available on StatsWales and through the StatsWales open data services. Are all the data Official Statistics? Most of the indicators (33) are based on sources that have been published as Official Statistics, that is they have been published by government statisticians, or by other public bodies, under the Code of Practice for Statistics. 28 of these indicators are based on sources that have been published as National Statistics. That is the United Kingdom Statistics Authority has designated these statistics as National Statistics, signifying compliance with the Code of Practice for Statistics. This means that they meet the highest standards of trustworthiness, quality and public value. 12 indicators are based on other sources such as administrative data held by government departments. 1 indicator currently has no data. Although not all of the data sources used are from official statistics, the report itself has been developed and published in accordance with the Code of Practice for Statistics. Ahead of the 2019 publication we will be seeking to gain National Statistics designation through assessment by the Office for Statistics Regulation. Some of the narrative included in the “globally responsible” goal report are based on factual statements of policy and programme implementation. These data are not collected through official statistics sources and although reported here for context we cannot provide assurance about data quality. The Quality report for contextual information provides further information, where available, about the data used as contextual information in the goal narratives. What else should I know about the data? The Quality report for contextual information alongside this release provides links to quality information about each of the data sources used to measure the national indicators, or provides that information where it does not exist elsewhere. Who are the users of this report? It is anticipated this report will be used by Welsh Government; the National Assembly for Wales (including Assembly Members and committees); the media; and the general public to (i) help understand the Well-being of Wales (ii) progress being made against the 7 well-being goals and (iii) where Wales is making progress against the United Nations Sustainable Development Goals. The national indicators and milestones once published can help public bodies who are subject to the future generation law understand further the nature of the change expected in achieving the well-being goals. The national indicators should be considered as useful evidence to assist public bodies in understanding the main areas where progress should be made in relation to the well-being goals. The national indicators will also have a specific role as they must be referred to by public services boards in Wales when they are analysing the state of economic, social, environmental and cultural well-being in their areas. The report should also be used by public bodies to develop and review well-being assessments and to set and review well-being objectives required under the Well-being of Future Generations (Wales) Act. The annual well-being report must also be taken into account by the Future Generations Commissioner for Wales when they prepare and publish their ‘Future Generations Report’. For the UK as a whole, the Office for National Statistics (ONS) has a 'National Well-being Programme'. The publication 'Measuring National well-being: Quality of Life in the UK, 2018' provides an assessment of UK progress against a set of headline national well-being indicators. In Scotland, the National Performance Framework (NPF) sets out a vision for national well-being and measures achievement in relation to this. The new NPF was launched on 11 June 2018 following an extensive open review process and is underpinned by statute (the Community Empowerment (Scotland) Act 2015). A wide range of indicators are used to assess progress towards the Purpose and National Outcomes. These provide a broad measure of national well-being, incorporating a range of economic, social and environmental indicators. Performance is reported on a new NPF website which is updated as soon as new data become available. It includes performance on equality groups and area based inequalities. In Northern Ireland, the principal mechanism for assessing societal well-being is the well-being framework of 12 outcomes that was developed by the previous Executive, consulted on and refined during 2016-2017. This framework, which contains 49 supporting population indicators, over-arches the Northern Ireland Civil Service Outcomes Delivery Plan and progress on the outcomes and indicators is currently reported through an Outcomes Viewer. Northern Ireland Statistics and Research Agency continues to participate in the ONS-led Measuring National Well-being programme and publish a well-being analysis based on the ONS well-being measures, where NI data availability allows.